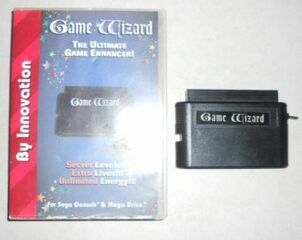 The Game Wizard is a "video game enhancer" released for the Sega Mega Drive that was released by Innovation for the which allows the user to manipulate video games. It is similar to the (Pro) Action Replay and the codes are in the same format, with up to four codes being able to be entered at once. A Super Nintendo version was also released but info on the Mega Drive version seems to be more rare to come by. While essentially a cheaper alternative to Datel's Action Replay, Innovation claimed the Game Wizard had an edge as it is fully compatible with X-Men, a game that requires a soft reset at one point in the game. A Sega Game Gear version of the Game Wizard was advertised, though whether it made it to production is currently uncertain. A special start up process was required, probably to bypass the region/CRC checks in most games. First, the switch must be in the middle, then the console powered on, then the switch moved up, and reset must be pressed. Unlike the Pro Action Replay, the switch must be set to down for codes to be active.